Saturn, Venus and Antares will line up in the sky Thursday, Oct. 27. Here, the trio is shown at 6:30 p.m. local time. About a half-hour after sunset Thursday evening (Oct. 27), look low in the southwest sky to spot a planetary/stellar lineup of two bright planets and one of the brightest and most colorful stars in the sky. 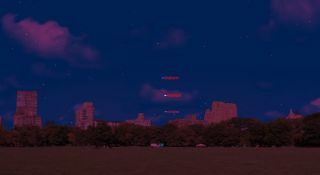 The two planets — the brilliant Venus and yellow-white Saturn — will appear to form a nearly perfect vertical line in the sky with the 15th brightest star, the reddish supergiant Antares. Since your clenched fist measures roughly 10 degrees in width when held at arm's length, the length of the Saturn/Venus/Antares lineup will stretch about "three-quarters of a fist" in length. If you search for this lineup, it will help considerably if you use binoculars. Venus will be distinct to the naked eye, but it will likely be more difficult to pick up Saturn and especially Antares against the rather bright twilight sky unaided. Antares also has the unfortunate distinction of being the lowest of the three, less than 10 degrees ("one fist") above the southwest horizon, just 30 minutes after sundown. And while all three objects resemble stars, only Antares will seem to twinkle. Although it measures hundreds of times larger than Earth's sun, at a distance of 550 light-years (3.3 quadrillion miles), it looks to Earthlings like a glowing dot, even in large telescopes. So its light is easily distorted by Earth's boiling atmosphere, hence the twinkling effect. In contrast, Venus and Saturn — located only 114 million miles (183 million kilometers) and 1 billion miles (1.6 billion km) from Earth, respectively — appear as distinct disks through telescopes. They very rarely appear to twinkle. After Thursday, Venus will rapidly leave Saturn and Antares behind as it moves away to the east. The planet will gradually increase in prominence in the weeks and months to come, ultimately becoming a stupendously dazzling evening star by midwinter early next year. In contrast, Antares and Saturn will soon bid evening skywatchers a fond adieu, dropping into the sunset fires. Antares will disappear first, about a week after the lineup occurs, and Saturn will leave by month's end. They will both come back into view in December, low in the southeast before sunrise.